Low cell retention and engraftment after transplantation limit the successful application of stem cell therapy for AKI. Engineered microenvironments consisting of a hydrogel matrix and growth factors have been increasingly successful in controlling stem cell fate by mimicking native stem cell niche components. Here, we synthesized a bioactive hydrogel by immobilizing the C domain peptide of IGF-1 (IGF-1C) on chitosan, and we hypothesized that this hydrogel could provide a favorable niche for adipose-derived mesenchymal stem cells (ADSCs) and thereby enhance cell survival in an AKI model. In vitro studies demonstrated that compared with no hydrogel or chitosan hydrogel only, the chitosan–IGF-1C hydrogel increased cell viability through paracrine effects. In vivo, cotransplantation of the chitosan–IGF-1C hydrogel and ADSCs in ischemic kidneys ameliorated renal function, likely by the observed promotion of stem cell survival and angiogenesis, as visualized by bioluminescence imaging and attenuation of fibrosis. In conclusion, IGF-1C immobilized on a chitosan hydrogel provides an artificial microenvironment for ADSCs and may be a promising therapeutic approach for AKI. Synthetic peptides designed to mimic the biologic properties of parent proteins could provide clinical benefits similar to those of full-length growth factors, with the advantages of reduced costs and better stability.15 A growing number of studies have used mimicking peptides, such as RGD (Arg-Gly-Asp), QK (a 15-amino-acid peptide mimicking the receptor binding region of vascular endothelial growth factor), and QHREDGS (Gln-His-Arg-Glu-Asp-Gly-Ser) to substitute growth factors, fibronectin, vascular endothelial growth factor (VEGF), and angiopoietin-1, respectively, for increasing the bioactivity of engineered matrices.16–18 Insulin-like growth factor-1 (IGF-1) consists of 70 amino acids in a single chain, with domains A and B separated by a C domain and a D carboxy domain.19 IGF-1 is a potent mitogenic and prosurvival factor and is implicated as a key mediator in renal recovery in clinical settings.20,21 The C domain peptide of IGF-1 (IGF-1C), a 12–amino acid sequence GYGSSSRRAPQT, has been identified as the active region of IGF-1 protein22 and is relevant to promotion of healing of corneal epithelial wounds.19 This evidence leads to our hypothesis that IGF-1C possesses therapeutic effects similar to those of their full-length counterparts. Therefore, we developed chitosan (CS)-based injectable hydrogel with immobilized IGF-1C (CS–IGF-1C) to strengthen the supportive niche function favoring survival and therapeutic benefits of transplanted adipose tissue–derived mesenchymal stem cells (ADSCs) in a murine model of AKI. IGF-1 was implicated as an important mediator of kidney regeneration23 and C domain of IGF-1 (IGF-1C), a 12–amino acid sequence GYGSSSRRAPQT (Supplemental Figure 1A). It also exhibits a mitogenic and prosurvival role in wound repair after injury.19 To investigate whether immobilization of IGF-1C could enhance therapeutic effects of stem cells, IGF-1C was grafted onto the side chain of CS to obtain CS–IGF-1C (Figure 1A). Successful IGF-1C coupling to the side group of alkynyl-substituted CS was confirmed by Fourier-transform infrared (FT-IR) spectroscopic analysis. Both peaks associated to alkynyl group (3082 cm−1≡CH stretching and 2102 cm−1 C≡C stretching) disappeared and lowered. In addition, the peaks at 2831 and 1172 cm−1 were seen as a result of C-H stretching of methylene and methyl groups and C-O stretching of hydroxyl group in the grafted IGF-1C segment (Figure 1B). This finding indicates the immobilization of IGF-1C to the side group of alkynyl-substituted CS. CS–IGF-1C hydrogel is biocompatible and favors cell proliferation in vitro. (A) IGF-1C was grafted onto CS by a click reaction between the azide of IGF-1C–N3 and the alkyne of alkynyl-CS. (B) The FT-IR analysis shows the characteristic peaks of CS–IGF-1C and alkynyl-CS. The spectrum displays the characteristic peaks at 3082 and 2102 cm−1 for the alkynyl group. Furthermore, the peaks at 2831 and 1172 cm−1 associated with the methylene and methyl groups and hydroxyl group in the grafted IGF-1C segment are also shown. (C) Assessment of the rheologic profile of CS–IGF-1C hydrogel with temperature changes. (D) Scanning electron micrograph image reveals the morphologic structure of lyophilized CS–IGF-1C hydrogel. Insert shows the gelation of the hydrogel. (E) Cell-counting kit-8 assay shows ADSC viability in the presence of different concentrations of CS–IGF-1C hydrogel in in vitro culture. Data are expressed as mean±SEM. (F) BLI assay reveals enhanced proliferation of ADSCs cultured on CS–IGF-1C hydrogel–coated plates. (G) Quantitative analysis of BLI signals. The signal activity is expressed as photons/s per cm2 per steradian (sr). Data are expressed as mean±SEM. *P<0.05 versus noncoating; #P<0.05 versus CS. (H) Real-time RT-PCR analysis of proliferation-related gene expression of ADSCs cultured on CS–IGF-1C hydrogel, CS hydrogel–coated, or noncoated plates for 1, 7, and 14 days. Data are expressed as mean±SEM. *P<0.05 versus noncoated; #P<0.05 versus CS. All experiments were performed in triplicate. Thermosensitive CS hydrogel is an ideal injectable scaffold to deliver stem cells.24 Rheologic studies were carried out to analyze the gelation properties of CS–IGF-1C hydrogel. The rheologic profile with temperature changes of CS–IGF-1C hydrogel (Figure 1C) was evaluated and compared with that of CS hydrogel without IGF-1C immobilization (CS hydrogel) (Supplemental Figure 1B). With increasing temperature from 10°C to 50°C, both CS–IGF-1C and CS hydrogel showed obvious enhancement of the storage modulus (G′), indicating the phase transition of solution to gel. The gelation temperature of CS–IGF-1C hydrogel was between 35°C and 36°C, similar to that of CS hydrogel, indicating that CS–IGF-1C hydrogel is suitable for the in situ transformation from liquid to hydrogel at body temperature. The morphologic structure of lyophilized CS–IGF-1C hydrogel was observed using scanning electron microscopy. The hydrogels show homogeneous and interconnected pores with averaged pore size of about 50 μm (Figure 1D). In the present study, ADSCs were isolated from transgenic mice, which express firefly luciferase (Fluc) and green fluorescent protein (GFP) (Supplemental Figure 2). 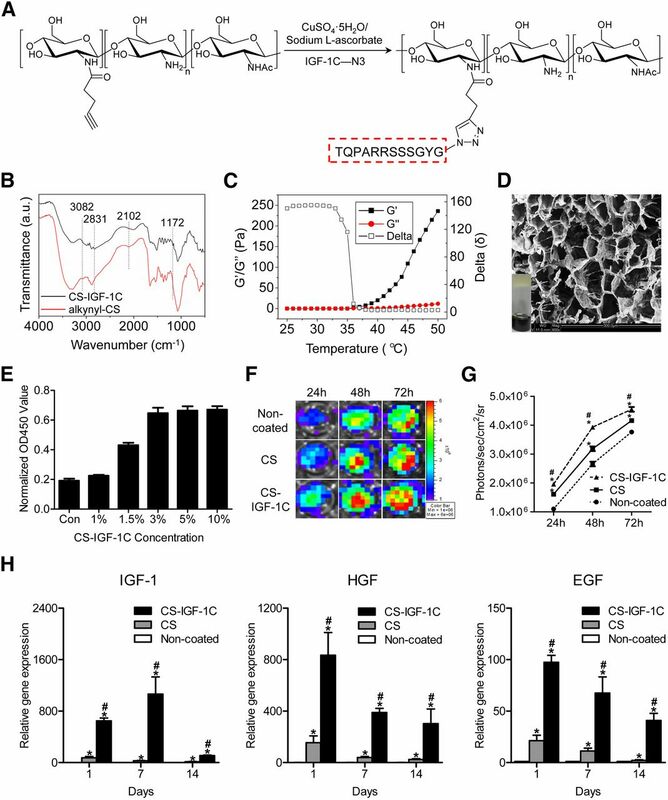 Cell proliferation assay indicated that the optimal concentration of CS–IGF-1C hydrogel was 3% (Figure 1E), and subsequent experiments revealed superior biocompatibility of CS–IGF-1C hydrogel (Supplemental Figure 3). Bioluminescence imaging (BLI) showed that ADSCs expanded more rapidly when cultured on CS–IGF-1C hydrogel–coated plates than on noncoated or CS-coated plates (Figure 1, F and G). In addition, the expression of proliferation-related genes IGF-1, hepatocyte growth factor (HGF), and epithelial growth factor (EGF) were drastically upregulated in ADSCs cultured on CS–IGF-1C hydrogel–coated plates compared with that on CS hydrogel–coated or noncoated plates (Figure 1H). Moreover, the phenotypic and multidifferentiation properties of ADSCs were not influenced by CS–IGF-1C or CS hydrogel in in vitro culture (Supplemental Figure 4). To examine the cell protective effects of CS–IGF-1C hydrogel, ADSCs were treated with hydrogen peroxide (H2O2) and cell survival was determined by BLI. H2O2 treatment resulted in a dose-dependent decrease of BLI signal. When cells were cultured on CS hydrogel–coated plates, cell survival displayed a significant amelioration and CS–IGF-1C hydrogel further increased this effect (Figure 2, A and B). To determine the pathway involved in this protective action, we measured the expression of apoptosis-related genes in ADSCs after treatment with H2O2 (100 mM) for 2 hours. H2O2 treatment increased apoptosis genes Bax, Bad, Caspase-3/9, Fas, and FasL expression in ADSCs. Coating with CS hydrogel markedly reduced the expression of those genes, which was further decreased in cells by CS–IGF-1C hydrogel treatment (Figure 2C). CS–IGF-1C hydrogel exerts antiapoptotic effects in vitro. (A) ADSC survival upon exposure to H2O2 was analyzed by BLI. ADSCs were cultured on CS–IGF-1C hydrogel–coated, CS hydrogel–coated, or noncoated plates and exposed to H2O2. (B) Quantification of BLI signals reveals that H2O2 treatment resulted in dose-dependent apoptotic cell death and that CS–IGF-1C hydrogel ameliorated cell survival significantly. Data are expressed as mean±SEM. *P<0.05 versus noncoated; #P<0.05 versus CS. (C) Real-time RT-PCR analysis of apoptosis-related gene expression of ADSCs after treatment with 100 nM H2O2 for 2 hours. The cells were cultured on CS–IGF-1C hydrogel–coated, CS hydrogel–coated, or noncoated plates for 1, 7, and 14 days. Data are expressed as mean±SEM. *P<0.05 versus noncoated; #P<0.05 versus CS. Experiments were performed in triplicate. To evaluate the prosurvival activities of CS–IGF-1C hydrogel, we performed BLI analysis to longitudinally track ADSC survival in the AKI model. Our BLI data exhibited robust signals from the kidney region at day 1 after intrarenal delivery of ADSCs in all groups, which indicated successful ADSC transplantation. However, the ADSC group experienced significant donor cell death in the following days. 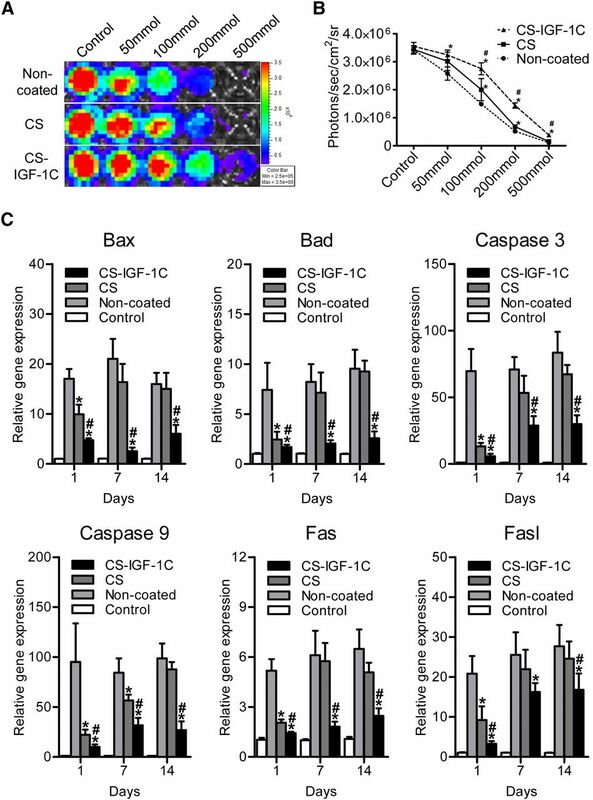 Serial BLI of the same animals demonstrated ameliorated cell engraftment by CS hydrogel application, and CS–IGF-1C hydrogel further increased this effect, suggesting that CS–IGF-1C hydrogel could augment cell survival and might provide a way to increase therapeutic potential of ADSCs (Figure 3, A and B). The increased cell engraftment by CS–IGF-1C hydrogel was also confirmed by immunohistology (Figure 3, C and D). Moreover, the proliferative index of GFP+ ADSCs delivered with CS–IGF-1C hydrogel was significantly higher than that with CS hydrogel or PBS (Figure 3, E and F). In addition, we conducted immunofluorescence and hematoxylin and eosin staining of the same kidney section to better observe localization, distribution, and engraftment of ADSCs embedded in hydrogels. The cell clumps of transplanted ADSCs were observed in the context of kidney within hydrogels at day 3 (Figure 3G). At day 14, cell migration out of hydrogel could be detected (Figure 3H). Moreover, CS–IGF-1C hydrogel could significantly improve cell survival and further promote cell migration. CS–IGF-1C hydrogel increases ADSC survival, proliferation, and migration in vivo. (A) The fate of ADSCs after transplantation was tracked by molecular imaging. Images are from representative animals receiving 1×106 ADSCs alone, with CS hydrogel or CS–IGF-1C hydrogel. (B) Quantitative analysis of BLI signals demonstrate that cell survival was improved by CS hydrogel and CS–IGF-1C hydrogel application at all time points. The CS–IGF-1C hydrogel group showed significantly better cell survival. Data are expressed as mean±SEM. (C) Representative photomicrographs display the engraftment of ADSCs (GFP, green) within kidneys at days 3 and 14. Proximal tubular epithelial cells were stained by rhodamine-labeled lens culinaris agglutinin (LCA, red). (D) Quantitative analysis data reveal that CS hydrogel improved cell engraftment and CS–IGF-1C hydrogel further increased this effect. Data are expressed as mean±SEM. *P<0.05 versus ADSCs; #P<0.05 versus ADSCs cotransplanted with CS hydrogel (ADSCs/CS). (E) Representative images show the proliferation (Ki-67, red) of transplanted ADSCs (GFP, green) in the border regions 3 days after AKI. DyLight 649-labeled LCA staining (cyan) was performed to reveal renal structure. (F) Quantification of the proliferation index of ADSCs. Data are expressed as mean±SEM. *P<0.05 versus ADSCs; #P<0.05 versus ADSCs/CS. (G) Immunofluorescence and hematoxylin and eosin staining of the same 3-day kidney section showing the localization, distribution, and engraftment of ADSCs delivered by CS or CS–IGF-1C hydrogels. (H) Representative photographs revealing the migration of ADSCs at day 14. Dashed lines indicate the border between injection site and renal tissue. Cells were counterstained with 4′,6-diamidino-2-phenylindole to reveal nucleus (blue). Experiments were performed in triplicate. Scale bars, 100 µm. ADSCs/CS–IGF-1C, ADSCs cotransplanted with CS–IGF-1C hydrogel; HPF, high-power field. It has been proposed that MSCs play a crucial role in tissue regeneration by modulating inflammation.25 To determine the anti-inflammatory effects of CS–IGF-1C hydrogel, we performed immunostaining of CD68 and TNF-α to evaluate macrophage infiltration and oxidative stress. Macrophage recruitment and TNF-α expression were significantly decreased in the ADSC and CS–IGF-1C hydrogel cotransplantation group compared with the other groups (Figure 4, A–D). Similar results were obtained by measuring gene expression of pro- and anti-inflammatory cytokines using quantitative RT-PCR analysis (Supplemental Figure 5, A and B). These data indicated that the anti-inflammatory actions of ADSCs could be strengthened by CS–IGF-1C hydrogel. CS–IGF-1C hydrogel enhances anti-inflammatory effects of ADSCs. (A) Representative images of CD68 immunostaining (red) show the macrophage recruitment at day 3 after AKI. Proximal tubular epithelial cells were stained with fluorescein-labeled lens culinaris agglutinin (LCA; green). (B) Quantitative analysis of infiltrated CD68-positive cells. Data are expressed as mean±SEM. (C) Representative images show TNF-α immunostaining (red) detected in proximal tubular epithelial cells (fluorescein-labeled LCA, green) at day 3. (D) Quantification of TNF-α staining. Data are expressed as mean±SEM. *P<0.05 versus PBS; #P<0.05 versus ADSCs; $P<0.05 versus ADSCs cotransplanted with CS hydrogel (ADSCs/CS). The number of positive cells was counted by a blinded investigator in ten randomly selected areas. Experiments were performed in triplicate. Scale bars, 100 µm. ADSCs/CS–IGF-1C, ADSCs cotransplanted with CS–IGF-1C hydrogel. The therapeutic effect of MSCs is mainly attributed to their paracrine actions and the proangiogenic cytokine expression.26 To investigate whether CS–IGF-1C hydrogel could enhance the proangiogenic activity of ADSCs, ADSCs from normal mice were transplanted into VEGFR2-luc transgenic mice. The ADSC-induced VEGF receptor 2 (VEGFR2) expression as a read-out for angiogenesis can be monitored by BLI in real time.27 BLI signal was found in all groups other than sham, and the strongest signal was detected in the CS–IGF-1C hydrogel and ADSC cotransplantation group, which suggests that VEGF/VEGFR2 pathways were activated and IGF-1C could increase this angiogenic effect (Figure 5, A and B). BLI signal detected in PBS group indicates that injury also could initiate angiogenesis. This molecular pattern was also reflected in histologic examination of neovascularization. Angiogenesis within hydrogel injection sites assessed by immunohistology revealed that microvascular density was significantly enhanced by CS–IGF-1C hydrogel application at 14 days, which is consistent with BLI results (Figure 5, C and D). Double staining of GFP and CD31 also revealed markedly increased microvascular density by immobilized IGF-1C at day 3 (Supplemental Figure 6). 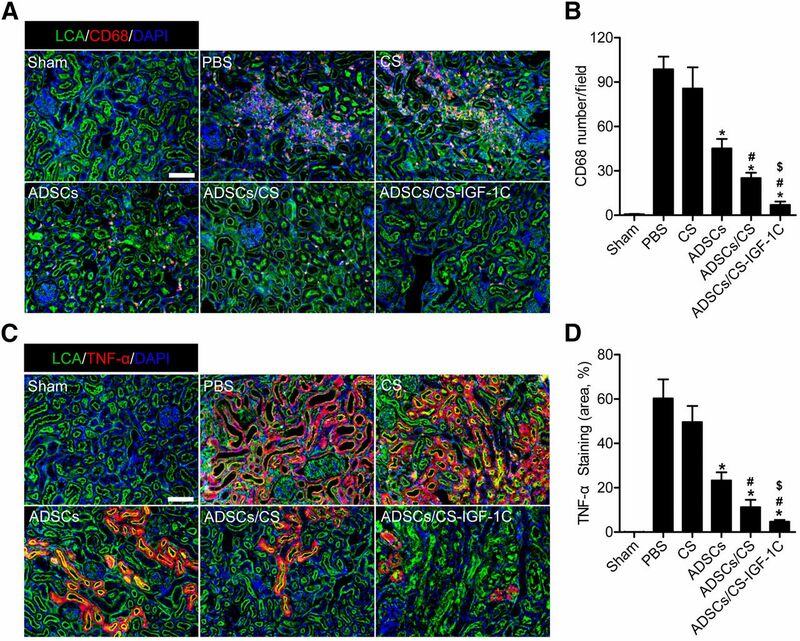 These results suggest that CS–IGF-1C hydrogel could improve the proangiogenic properties of ADSCs in the post-ischemic kidney. CS–IGF-1C hydrogel augments proangiogenic effects of ADSCs. (A) In vivo BLI tracking the spatiotemporal kinetics of Vegfr2-luc expression following ADSCs transplantation in mouse AKI model. (B) Quantitative analysis data reveals that ADSC-induced angiogenesis was improved by CS hydrogel and CS–IGF-1C hydrogel application. CS–IGF-1C hydrogel group showed better angiogenic effects compared with other groups. Data are expressed as mean±SEM. n=5. *P<0.05 versus PBS; #P<0.05 versus ADSCs; $P<0.05 versus ADSCs cotransplanted with CS hydrogel (ADSCs/CS). (C) Representative images of kidney sections stained for CD31 (green) at day 14. Scale bar, 100 μm. (D) Quantitative analysis reveal that capillary density was significantly higher in CS–IGF-1C hydrogel group compared with other groups. The number of capillary vessels was counted by a blinded investigator in ten randomly selected areas. Data are expressed as mean±SEM. *P<0.05 versus PBS; #P<0.05 versus ADSCs; (E) Real-time RT-PCR analysis of angiogenic factor expression in ADSCs cultured on normal plates (control) and CS hydrogel– and CS–IGF-1C hydrogel–coated plates. Data are expressed as mean±SEM. *P<0.05 versus noncoated; °P<0.05 versus CS. All experiments were performed in triplicate. ADSCs/CS–IGF-1C, ADSCs cotransplanted with CS–IGF-1C hydrogel; sr, steradian. To gain insight into the mechanisms of ADSC-induced angiogenesis, real-time RT-PCR analysis was carried out. The results revealed that angiogenesis-related genes Ang-1, Ang-2, VEGF-A, HIF-1α, PLGF, PDGF-BB, bFGF, and CCL5 were significantly upregulated in CS–IGF-1C hydrogel group compared with those cultured on normal or CS hydrogel–coated condition (Figure 5E). 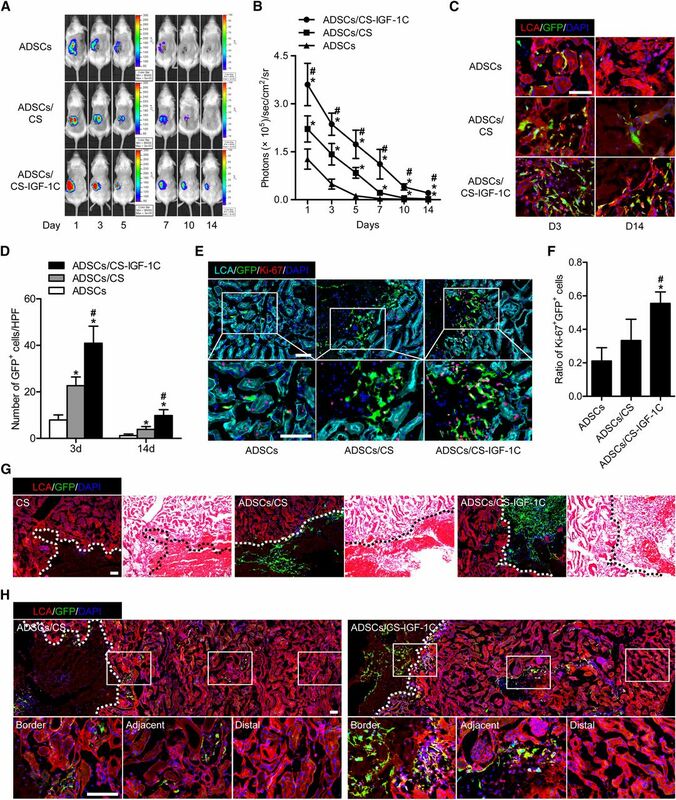 Those results indicate that CS–IGF-1C hydrogel can enhance the proangiogenic activities of ADSCs and further promote kidney angiogenesis after injury. We next examined whether CS–IGF-1C hydrogel could promote cell proliferation by proliferating cell nuclear antigen (PCNA) staining. The number of PCNA+ cells was markedly higher in kidneys injected with ADSCs than those injected with PBS and further increased by CS–IGF-1C hydrogel cotransplantation at day 3 (Figure 6, A and B). Consistent results were observed when we evaluated renal cell proliferation at hydrogel injection sites at 28 days (Supplemental Figure 7). Furthermore, renal cell apoptosis after injury was assessed by terminal deoxynucleotidyl transferase–mediated digoxigenin-deoxyuridine nick-end labeling assay. ADSC transplantation could alleviate cell apoptosis compared with the PBS group at day 3. This effect was further enhanced by CS and CS–IGF-1C hydrogel application (Figure 6, C and D). These results indicate that the therapeutic contributions of CS–IGF-1C hydrogel to renal repair include stimulating endogenous cell regeneration and inhibiting renal cell apoptosis. 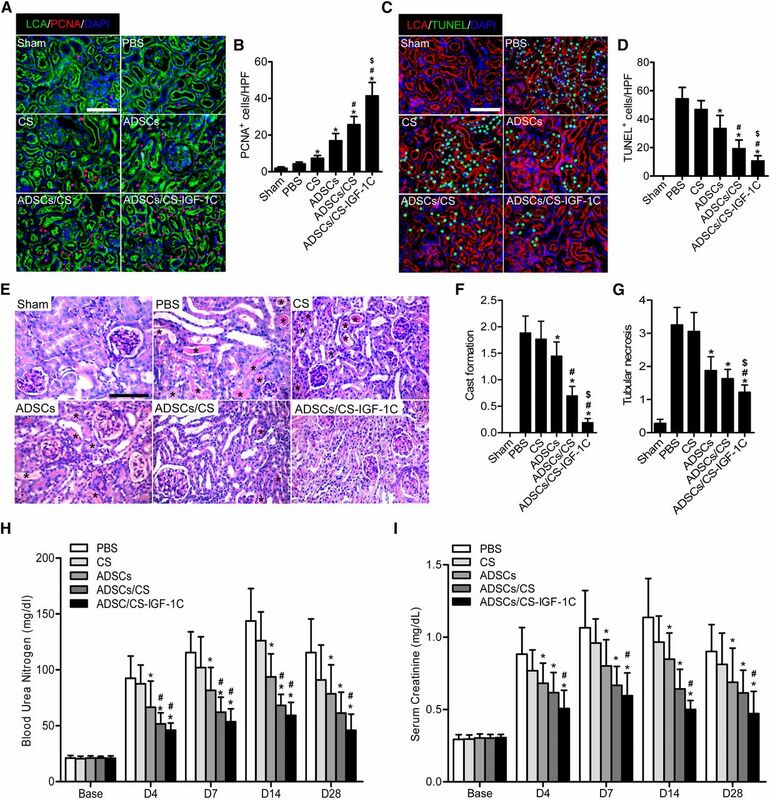 Treatment of ADSCs and CS–IGF-1C hydrogel accelerates renal recovery. (A) Representative images show PCNA immunostaining (red) detected in proximal tubular epithelial cells (fluorescein-labeled lens culinaris agglutinin [LCA], green) 3 days after injury. (B) Quantification of PCNA-positive cells. Data are expressed as mean±SEM. n=5. (C) Representative images of terminal deoxynucleotidyl transferase–mediated digoxigenin-deoxyuridine nick-end labeling (TUNEL) staining (green) in proximal tubular epithelial cells (rhodamine-labeled LCA, red) at day 3. (D) Quantification of TUNEL assay. Data are expressed as mean±SEM. n=5. Nuclei were counterstained with 4′,6-diamidino-2-phenylindole (blue). (E) Representative images of periodic acid-Schiff–stained kidney sections at day 3. Massive necrosis in proximal tubules with hyaline cast (asterisks) is observed, and cotransplantation of ADSCs and CS–IGF-1C hydrogel reveals almost complete prevention of histopathologic alterations after ischemia/reperfusion injury. Quantitative histologic assessment of (F) hyaline cast formation and (G) tubular necrosis. Data are expressed as mean±SEM. n=5. (H) BUN and (I) serum creatinine levels were measured at different time points after severe AKI (unilateral ischemia/reperfusion and contralateral nephrectomy). Data are expressed as mean±SEM n=10 on days 2, 4, 7, and 10; n=8 on day 14; n=6 on day 28. *P<0.05 versus PBS; #P<0.05 versus ADSCs; $P<0.05 versus ADSCs cotransplanted with CS hydrogel (ADSCs/CS). Scale bars, 100 µm. ADSCs/CS–IGF-1C, ADSCs cotransplanted with CS–IGF-1C hydrogel; HPF, high-power field. To investigate histologic changes due to ADSCs and CS–IGF-1C hydrogel application, light-microscopic examination of kidneys was carried out by periodic acid-Schiff staining at day 3. Massive tubular cell necrosis and hyaline cast formation were observed in the proximal tubules of kidneys from mice in the PBS control group, which were alleviated to some extent by ADSC transplantation. Cotransplantation of ADSCs and CS–IGF-1C hydrogel demonstrated that necrotic tubules and hyaline casts were significantly reduced compared with those of ADSCs and CS hydrogel cotransplantation, indicating more pronounced renoprotective actions of IGF-1C (Figure 6, E–G). To investigate whether CS–IGF-1C facilitates ADSC-mediated functional recovery, BUN and serum creatinine were examined. After AKI, the mice showed marked deterioration in renal function, as reflected by increased levels of BUN and serum creatinine. ADSC transplantation could significantly ameliorate renal function, and this effect was further enhanced by CS and CS–IGF-1C hydrogel application, as reflected by lower BUN and serum creatinine (Figure 6, H and I). Renal fibrosis is a direct consequence after injury and results in a progressive loss of renal function, ultimately leading to ESRD.28 It is characterized by excessive accumulation of ECM, primarily consisting of collagen 4 and fibronectin. Masson trichrome staining demonstrated a significant reduction in the fibrotic area of the ADSC and CS–IGF-1C cotransplantation-treated group compared with other groups (Figure 7, A and B). The kidney sections stained with collagen type 4 demonstrated findings similar to those for Masson trichrome staining (Figure 7, C and D). In addition, cotransplantation of ADSCs and CS–IGF-1C significantly reduced myofibroblast infiltration and decreased matrix metalloproteinase-2 (MMP-2) expression compared with the other groups (Supplemental Figure 8). Furthermore, the histologic pattern was confirmed by mRNA expressions of ECM synthesis and fibrosis pathway–related genes at month 2. The enhanced expression of collagen type 1 α1, TGF-β, fibronectin genes, and MMP-9 in the PBS group was remarkably reduced by CS hydrogel or ADSC treatment and was further alleviated in ADSCs and CS–IGF-1C hydrogel cotransplantation group (Figure 7E). On the other hand, administration of ADSCs by CS–IGF-1C hydrogel significantly increased the expression of antifibrotic genes, including bone morphogenetic protein-7, tissue inhibitor of metalloproteinase-1 and -2, and E-cadherin (an epithelial marker reflecting the severity of fibrosis) (Figure 7F). These results suggest that CS–IGF-1C hydrogel facilitates the antifibrotic actions of ADSCs in AKI. Consequently, we evaluated the safety of administration of ADSCs with hydrogels over the long term. No ectopic differentiation was observed in renal parenchyma of animals receiving any treatment modalities (Supplemental Figure 9). 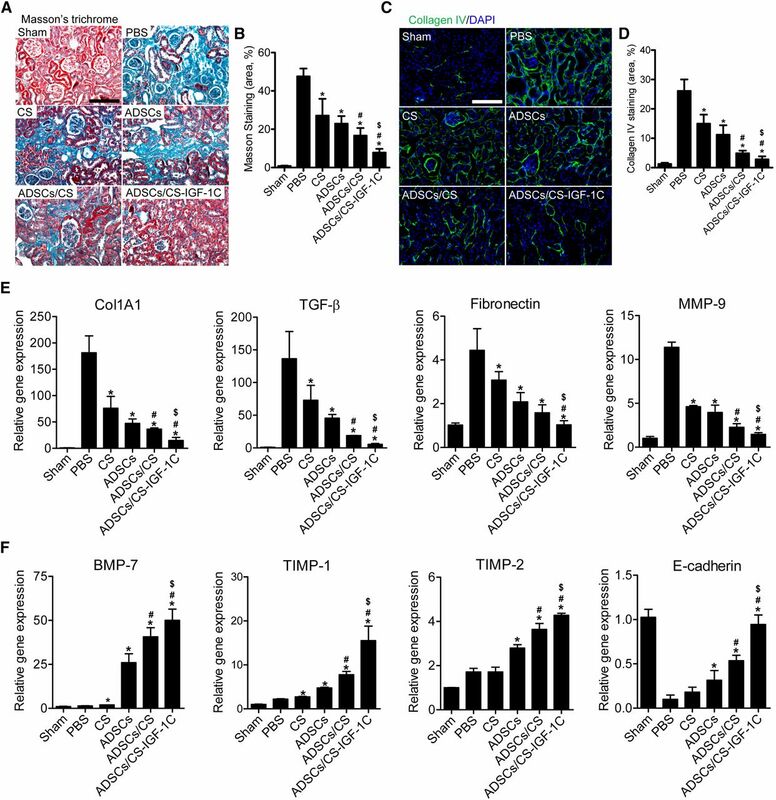 Treatment of ADSCs and CS–IGF-1C hydrogel attenuates renal fibrosis. (A) Representative images of kidney sections stained for Masson trichrome 2 months after AKI. (B) Quantification of Masson staining. (C) Representative images of kidney sections stained with collagen 4 two months after AKI. (D) Quantification of collagen 4 staining. n=5. Ten randomly selected areas were analyzed. Scale bars, 100 µm. (E and F) Real-time RT-PCR analysis of fibrosis-related gene expression of kidney 2 months after AKI. All experiments were performed in triplicate. Data are expressed as mean±SEM. *P<0.05 versus PBS; #P<0.05 versus ADSCs; $P<0.05 versus ADSCs cotransplanted with CS hydrogel (ADSCs/CS). Scale bars, 100 µm. ADSCs/CS–IGF-1C, ADSCs cotransplanted with CS–IGF-1C hydrogel; BMP-7, bone morphogenetic protein-7; Col1a1, collagen type 1 α1; DAPI, 4′,6-diamidino-2-phenylindole; TIMP-2, tissue inhibitor of metalloproteinase-2. In the present study, we characterized an injectable biomimetic scaffold generated by immobilization of IGF-1C to CS hydrogel as a carrier system for ADSC-based therapeutics. CS–IGF-1C exerted proproliferative, antiapoptotic, and proangiogenic effects on cultured ADSCs. When transplanted into ischemic kidney, CS–IGF-1C hydrogel could protect the delivered ADSCs and further promote functional and structural recovery of the kidney. These benefits can be attributed to the favorable niche produced by cell–hydrogel interplay, which led to enhanced cell survival, inhibited inflammatory responses, improved angiogenesis, and attenuated fibrosis (Figure 8). Schematic diagram depicts renoprotective effects of ADSCs and CS–IGF-1C hydrogel. 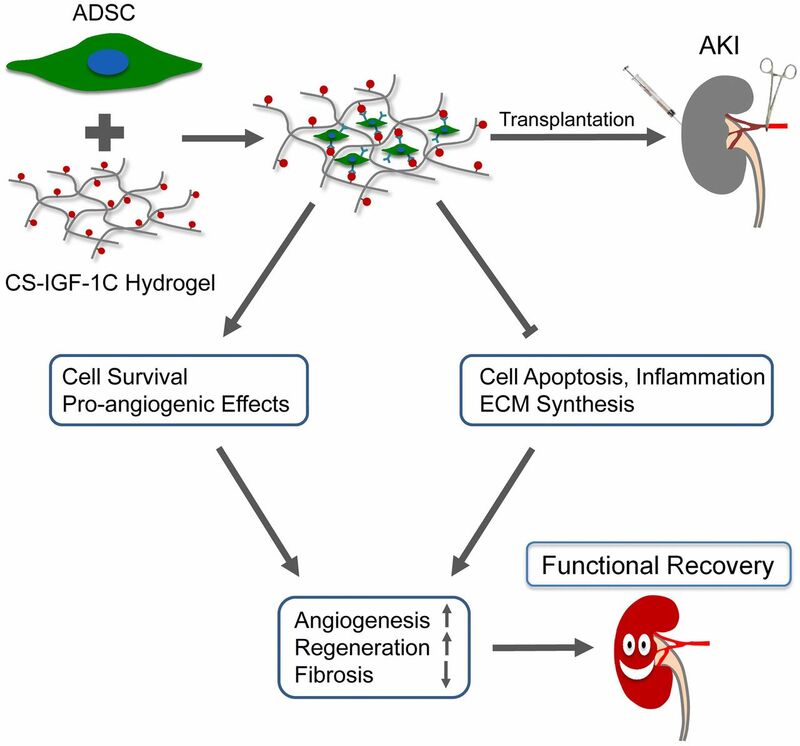 When cotransplanted into AKI model, CS–IGF-1C hydrogel could protect delivered ADSCs, facilitate their paracrine and anti-inflammatory effects, and inhibit ECM synthesis in the kidney, resulting in enhanced angiogenesis, regeneration, and alleviated fibrosis after kidney injuries. Consequently, CS–IGF-1C hydrogel therapy leads to improved functional and structural recovery of kidney. Stem cell transplantation is a promising option for treatment of AKI. However, this therapy is limited by low cell retention in the ischemic tissue.4 Lack of matrix support, ischemia, and inflammation are probably the major cause of donor cell death following transplantation.8,36 In this study, CS hydrogel and immobilized IGF-1C peptide serve as an effective niche for cell-matrix anchorage and activation of downstream signaling pathway of ADSCs. Together with enhanced paracrine effects by CS–IGF-1C hydrogel, ADSCs could inhibit inflammatory responses, promote angiogenesis, attenuate fibrosis, and facilitate the recovery of renal function. In rodent models, MSCs retard the progression of CKD by suppressing fibrosis.37–39 Our study confirmed this effect and further demonstrated that MSC therapy with CS–IGF-1C hydrogel showed increased attenuation of fibrosis by substantially inhibiting expression of MMPs; this has been implicated in initiation and progression of renal fibrosis through epithelial-mesenchymal transition as well as activation of fibroblasts.40 Concordantly, cotransplantation of ADSCs and CS–IGF-1C hydrogel led to downregulated expression of a range of profibrotic genes, such as TGF-β, collagen type 1 α1, and fibronectin, in addition to increased expression of antifibrotic genes after AKI. In summary, we developed and characterized a bioactive hydrogel-based system for intrarenal delivery of ADSCs for treating ischemic AKI. Covalent immobilization IGF-1C peptide to CS hydrogel provides an artificial niche for ADSCs and contributes to cell matrix anchorage and regulation of cell proliferation and inflammation in kidney regeneration after AKI. This hydrogel could increase ADSC survival, as revealed by BLI, and substantially ameliorate renal function. To our knowledge, this is the first study on immobilization of IGF-1C peptide to matrix for stem cell therapy. Delivering peptides that mimic the bioactivity of growth factors by covalent coupling to matrix is an attractive strategy for safe and effective stem cell–mediated regeneration. Complete methods are provided in the Supplemental Material. As summarized in Figure 1A, IGF-1C was grafted onto CS by click reaction between the azide of IGF-1C–N3 and the alkyne of alkynyl-substituted CS (alkynyl-CS). Briefly, IGF-1C, a peptide consisting of the amino acid sequence GYGSSSRRAPQT (Supplemental Figure 1A), was synthesized using manual solid-phase Fmoc–amino acid chemistry.44 Through use of condensation chemistry, 6-azido hexanoic acid (Alfa Aesar, Ward Hill, MA) was then linked to IGF-1C at the N-terminus to obtain IGF-1C–N3 (N3–GYGSSSRRAPQT). In parallel, the alkynyl-CS was synthesized by the condensation of CS (M=200,000; Jinke, China) with 4-pentynoic acid (Sigma-Aldrich, St. Louis, MO) according to a previous report.45 CS–IGF-1C, the product of click reaction between IGF-1C–N3 and alkynyl-CS, was dialyzed against deionized water for 3 days and then lyophilized. IGF-1C immobilized thermosensitive CS hydrogel (CS–IGF-1C hydrogel) was prepared as previously reported.46 In brief, the ice-cold β-glycerophosphate (β-GP) solution (2.29 M) was added to the CS–IGF-1C solution (3 w/v %) drop by drop under stirring in an ice bath for about 0.5 hours. The mixed solution was transferred to an incubator at 37°C for gelation. The final concentration of β-GP in the mixed solution was 0.23 M, and the pH value of the dialyzed CS/β-GP solution was 7.2. The CS hydrogel without IGF-1C immobilization was prepared with the same protocol. The chemical structure of CS and CS–IGF-1C was characterized using FT-IR technique as described elsewhere.47 The FT-IR transmittance spectrum in a wavelength region from 4000 to 500 cm−1 was acquired using an FT-IR spectrometer (FTS-6000 spectrometer; Bio-Rad, Hercules, CA). Rheologic measurement was performed on a 25-mm parallel-plate rheometer (TA Instruments, New Castle, DE).48 The rheologic properties of samples were measured within a temperature range from 10°C to 50°C with a constant heating rate of 1°C/min. The changes in the elastic (storage) modulus (G′) and the viscous (loss) modulus (G′′) were recorded as the change of temperature at a fixed frequency of 1 rad/s. The phase lag (δ) was used to determine the gelation temperature at which the elastic modulus (G′) and the viscous modulus (G′′) were equivalent. Furthermore, the morphology of CS–IGF-1C hydrogel after lyophilization was analyzed by scanning electron microscopy (Quanta 200; FEI, Brno, Czech Republic). Animal protocols were approved by the Nankai University Animal Care and Use Committee guidelines, which conform to the "Guide for the Care and Use of Laboratory Animals" published by the US National Institutes of Health (eighth edition, 2011). ADSCs were obtained from wild-type FVB mice or transgenic FVB-Fluc/GFP mice. FVB transgenic mice constitutively express Fluc and GFP reporter gene through the whole body.8 The double expression of Fluc/GFP can be used for tracking ADSCs by BLI and histology, respectively.8 In brief, the adipose tissue (peritoneal and subcutaneous sites) was minced and digested with 0.075% type 4 collagenase (Sigma-Aldrich) for 1 hour at 37°C. The disrupted tissue was filtered, and isolated cells were washed with α-MEM medium (Gibco, Grand Island, NY) and seeded with culture medium, which consisted of 80% α-MEM, 20% FBS (Gibco), and 5000 U/ml penicillin/streptomycin (Gibco). To determine the optimal concentration of CS–IGF-1C hydrogel for ADSC proliferation, a cell-counting kit-8 (Dojindo Molecular Technologies, Rockville, MD) was used. To investigate the biocompatibility of CS–IGF-1C hydrogel, 96-well plates were coated with CS or CS–IGF-1C hydrogel and 1×103 ADSCs were added per well. Cell viability was assessed using a live/dead assay kit (Invitrogen, Carlsbad, CA). Cell viability was calculated and normalized to the initial viability of the culture. To evaluate the proliferation of ADSCs cultured on different conditions, BLI assays were carried out at the same time. To investigate whether CS–IGF-1C hydrogel could rescue H2O2- induced injury, 96-well plates were coated with CS or CS–IGF-1C hydrogel. A total of 1×103 ADSCs per well were seeded and subcultured for 12 hours. H2O2 was added at concentrations of 50, 100, 200, and 500 mmol and incubated for 2 hours. BLI was performed to evaluate cell survival. Adult wild-type FVB mice (8–10 weeks old) were purchased from the Laboratory Animal Center of the Academy of Military Medical Science (Beijing, China). An ischemia/reperfusion-induced AKI model was set up as previously described.5 Briefly, animals were anesthetized by intraperitoneal injection of chloral hydrate (330 mg/kg). After a dorsal longitudinal incision, the left kidney was exposed and renal pedicle was clamped with a nontraumatic microvascular clamp for 40 minutes. Reperfusion was confirmed visually before the incision was closed. After 15 minutes of reperfusion, 1×106 ADSCs stably expressing GFP-Fluc were intrarenally injected into three sites of the left kidney cortex at 30 μl total volume suspended in PBS, CS hydrogel, or CS–IGF-1C hydrogel, respectively (n=15 for each group). PBS and CS hydrogel injection served as control. Sham-operated animals were subjected to the same surgical procedure without renal ischemia or cell/hydrogel transplantation. For real-time in vivo monitoring of the angiogenic effects of CS–IGF-1C hydrogel and surviving ADSC, transgenic VEGFR2-luc mice (Xenogen Corp., Hopkinto, MA) were used (n=10 for each group). The mice express Fluc under the promoter of VEGFR2 (VEGFR2-luc).27 ADSCs from wild-type mice were isolated for transplantation. For the assessment of renal function, mice underwent unilateral (left) 40-minute ischemia/reperfusion plus contralateral nephrectomy. At different time points after injury, blood samples were harvested and serum was collected for assessment of BUN and creatinine using a biochemical automatic analyzer (Vitalab Selectra E). Fluc activity within different cell numbers was confirmed ex vivo using a Xenogen IVIS Luminar Imaging System as described elsewhere.4 Renal BLI was performed on all animals as previously described.4,11 After intraperitoneal injection of the reporter probe d-luciferin (150 mg luciferin/kg body wt), animals were imaged for 1–10 min using the IVIS Luminar Imaging System. Statistical analyses were performed using GraphPad Prism 5.0 software (GraphPad Software Inc., San Diego, CA). Two-way repeated-measures ANOVA and two-tailed t test were used. Differences were considered significant at P values <0.05. Detailed methods for differentiation potential assay, histologic analysis, and quantitative RT-PCR can be found in the Supplemental Material. This work was partially supported by grants from the National Basic Research Program of China (2011CB964903), National Natural Science Foundation of China (81522023, 81220108015, 81371620, 81371699, and 81320108014), Tianjin Natural Science Foundation (14JCZDJC35200) and Program for Changjiang Scholars and Innovative Research Team in University (IRT13023). See related editorial, “Modified Hydrogels to Enhance Cellular Therapy for AKI: A Translational Challenge,” on pages 2219–2221. This article contains supplemental material online at http://jasn.asnjournals.org/lookup/suppl/doi:10.1681/ASN.2015050578/-/DCSupplemental. The End of Racial Disparities in Kidney Transplantation? Not So Fast!